March 9th is another Kidical Mass ride here in Philadelphia. I will be 34 weeks pregnant so you know you want to see me ride a cargo bike...or maybe my road bike. We shall see. 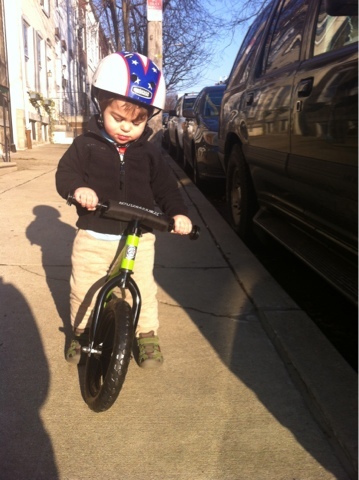 For the little guy's second birthday we bought him a strider balance bike. After a ton of research it seemed like the best option for us. For those not familiar with a balance bike, the thought is balancing is the harder part of learning to bike and pedaling is the easier part. So to avoid training wheels you teach balance first. They are popular all over Europe. I remember seeing them when we were in Amsterdam in 2010 and of course growing in popularity since then in the States. Some are made of wood, aluminum and steel. All depends. The strider is one of the lightest weight balance bikes on the market. We dug the easy step over frame and quick release handle bars and seat. Milo was able to hop on as he can do that on the balance trike he received for his first birthday. 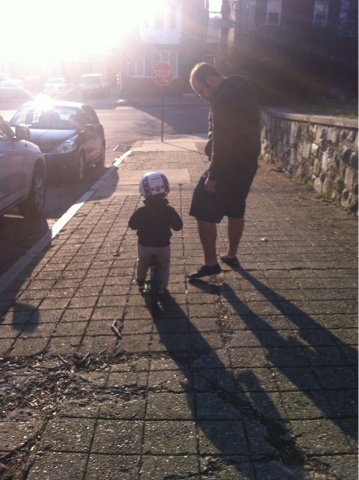 I just pulled him forward so he could see he could walk the bike himself and he was off. We started off downhill towards the park by our house. He did a good job keeping balance, he did get distracted at times but he is two so that is expected. When we got to the park he wanted no part in playing and asked to keep riding. So we went around the block. About a quarter way up the hill he needed a break and asked to be carried. All in all great ride. 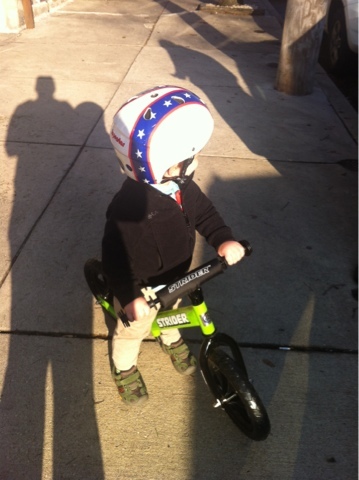 Can't wait for him to learn to coast on it too.